I offer garden photograph workshops all around the country. Built around my book “The PhotoBotanic Garden Photography Workshop” and the photo lessons at the Learning Center at PhotoBotanic.com, the workshops offer an opportunity to sharpen your skills and focus your concentration with an assignment theme for reach workshop. You can do this on your own, by giving yourself an assignment, something to work on – and just do it. For instance “focal points”. 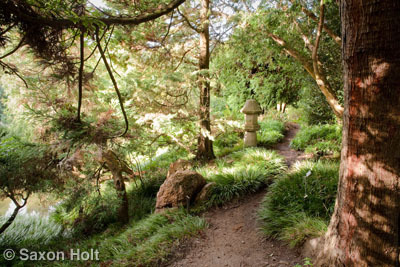 Here, at San Francisco Botanical Garden we are using the Japanese lanterns as an element, a focal point to draw the eye into the composition. When considering a photo it can be really helpful to find some element that will help the viewer focus on the the image and consider what story you are trying to tell. It does not necessarily need to be an object, it can be a bold plant for instance, but something in the photo needs to be the key to understanding it. Hand in hand with focal points comes “framing”, another Workshop theme. I actually stumbled onto that lesson theme as I watched the students (in the first photo), and noted the tree was a key element in helping to define the focal point. Consider this next scene in the South African collection at San Francisco Botanical Garden. 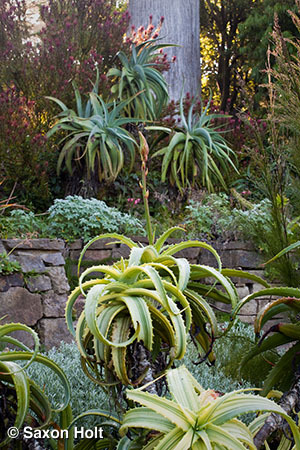 The bold, variegated aloe that is just beginning to put up its winter flower is an obvious attention grabber. But too often we are struck by the exciting potential of a garden photo but compose too loosely. Here, the focal point is not well framed; and there is a tree sticking out of the top of the photograph. Consider for a moment what the story is, and make all elements of the composition work for you. 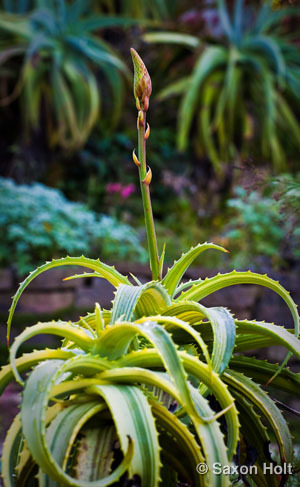 By coming in tighter and using the background shapes to anchor the corners, the aloe is framed and the eye wants to stay in the photograph. Another classic compositional tool, and Workshop theme is “lines”. Often pathways and walls offer the photographer some simple tools that draw the viewer into and through the photo, connecting the elements into one frame. 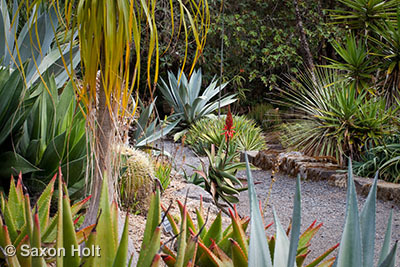 Here, the pathway that runs between these two sections of the succulent garden at SFBG help connect the left and right sides and pull the eye into the focal point which is the beautiful gray Agave. Note the elements that frame the scene: the line of Agave at the bottom, the group on the left, and the little explosion of shapes in the upper right. All these tools hold the photo together while the line pulls you into the focal point. Used this way the lines not only draw the eye into the photo, they carry the eye across the composition. In this photo, of a student at work using the camera to frame the scene before she moves the tripod into place. (You will use the tripod, right, Angela ?) Note there are multiple lines. 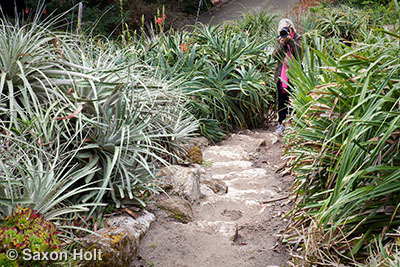 The pathway steps lead the eye from top to bottom, while the row of bromeliads and aloe lead left to right – directly to the focal point of the photographer. And note – the wonderful hot pink spot of color in her scarf help this composition as well. There is an lesson in The PhotoBotanic Garden Photography Workshop” on color as a composition tool. Whether or not you can get to a workshop, you can use the book and teach yourself. Experience is by far the best teacher and you learn by doing. Give yourself something to work on – and go do it. The book is available as an e-book at PhotoBotanic. Wondering if you are offering the photography workshop this year….